With a focus on creating digital toy apps, Toca Boca has become a powerhouse in the world of educational apps. Many of their apps have become huge hits amongst families (including mine!) -- apps such as Toca Hair Salon 2, Toca Tailor, and Toca Tailor Fairy Tales. If your juniors enjoyed playing with those apps, they’re going to enjoy this brand new app called Toca Mini. Toca Mini is a creative game which lets kids design their own 3D characters -- dubbed as “Minis”. Players start with a blank figurine base, which is divided into several areas: head, body, arms, and feet. Tap on an area to zoom in. To return to full-body view, tap on the person icon on the top left corner of the screen. While there is no specific order for designing the Mini, I suggest starting with the head first. This part is special because it has a facial feature design tool, which includes 16 options for eyes, mouths, noses, and eyebrows. Placing a facial feature on the character is only a matter of dragging and dropping at the desired position. Players can also return to add, modify, or remove more facial features. Toca Mini also includes two other design tools: background color and stamps. The background tool is a great way to paint skin/hair, design shirts/shorts, or create a stripe pattern on the socks. The stamps tool has more than 80 different shapes, including basic geometrical shapes, hairstyles. It also has popular icons such as water drop, heart, and star, as well as useful ones such as button, ribbon, shoe lace, and flower. In both the full-body and zoomed-in design view, players can rotate their Minis 360 degrees. This allows them to design even the back of the model. Once finished, players can then choose a backdrop and take a photo with the camera. Because it is not possible to save the creation, taking a snapshot is the only way to preserve it. Players can even make the model rotate before taking a snapshot of its back. All these photos can be accessed from the Camera Roll. Even though the developers recommend Toca Mini for juniors ages 3+, I think the app is more suited for juniors ages 4+. The kind of creativity needed to enjoy this app is easier to find in a four-year-old than a three-year-old. Older juniors also tend to have a larger perspective, so they can base their creations on more personalities. For example, they can recreate their favourite superheroes, cartoon characters, or even dream jobs. When designing your character, bear in mind that all the facial elements and stamps can be resized, rotated, and combined together. One thing that I’d suggest you do before putting those elements is to decide the color for each element. Toca Mini supports up to 60 different colors, which are organized in a scrollable wheel with three gradient options. One of the most enjoyable activity in Toca Mini is to tinker with the facial elements to see what fits. Getting the right face you want can take some time. The app intelligently helps speed up this process by automatically flipping the orientation of many symmetrical facial elements, such as the eyes and eyebrows. For example, once you put the left eye, the next eye you pull from the same placeholder will be the right one. The same can be applied to eyebrows and hair styles. If you want to override this behaviour, simply tap on the element before dragging it. It will toggle the current orientation and show its mirrored version. Another fun feature is how the Minis would react to your designs. When you zoom out into the full-body view, your Mini will move and sound as though he is admiring himself in front of a mirror. If you’re idle for too long, the character would wave, sing, or even dance to get your attention back. Before you start, decide the skin color of your Mini. Try putting it on one of the arms or feet first for reference. There is no erase button in Toca Mini -- simply slap on a different color if you want to erase an area. A stamp can be moved, resized, rotated, and removed as long as it’s the last stamp you’re tinkering with. Older stamps can’t be modified or removed. However, you can override a stamp with the exact one, just in a different color. Painting is applied on a layer underneath the stamps. You can’t use paint to override stamps. If you want to create a pair of shorts for your Mini, paint the body area with at least two different colors. Matching the top color with the upper arms can create a representation of a shirt. Use different paint colors to vertically divide socks and shoes. Experiment with stripe patterns for the socks. Use small-sized stamps to make realistic socks and shoes. Decide whether you want the head to be fully visible or not. To create a ninja or an astronaut, use the clothing color instead of the hair color as the base for the head. Decide the hair color for your Mini, and use it as the base for the head. If the person has a short hair, paint the lower area of the head with the skin color until it reaches a certain point where you want the hair to cover the forehead. To create hair effects, you can either remove some hair by placing skin-colored stamps, or place hair stamps of matching colors. Try various things, such as creating a one-eyed dog, or mimicking the haircut of a popular TV/movie character. 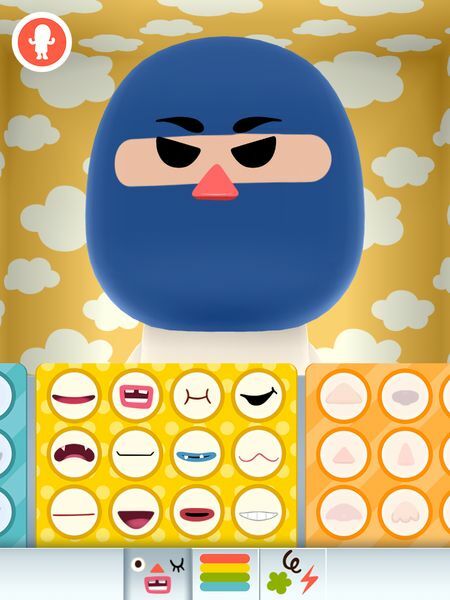 Toca Mini is a significant upgrade to Toca Boca’s previous suite of apps that only lets you style pre-made characters. Despite having a steeper learning curve, Toca Mini is far more powerful and flexible compared to its prequels. Along with Toca Builders, Toca Mini is one of the best creativity apps that you can get for your juniors.